A large gathering of kids, dignitaries and fans were on hand as two- time Olympic gold medalist, Gigi Fernandez, stopped by the BB&T Atlanta Open Family Zone to run the Hispanic Outreach clinic presented by Coca-Cola. 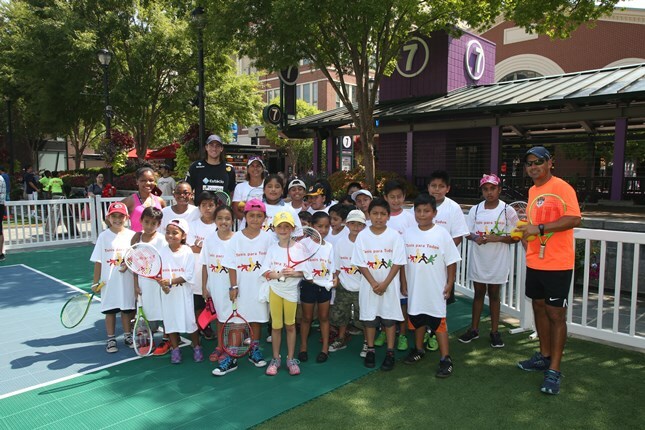 This was the second year that Fernandez has appeared at Atlantic Station and she shared her tennis expertise and passion with the children that attended the clinic. Fernandez was joined by ATP World Tour player, Marcelo Demoliner of Brazil. The professionals demonstrated the basics of the serve and return of serve the ball to the more that 100 kids that took part in the clinic. They also gave tips on how to incorporate fun games and friendly competition into the sport of tennis. "I've been playing all my life," Fernandez told a group of youngsters. "I grew up playing 4-5 hours per day and I'm trying explain why this is a great sport for all kids." Fernandez won gold in Barcelona in 1992 and the 1996 Atlanta Olympic Games in women’s doubles. Fernandez arrived at the clinic with both gold medals around her neck, so the children were able to get an up-close look at the hardware. Georgia Lt. Governor Casey was also in attendance and hit some balls at the Family Zone with Demoliner. Jacksonville State University Head Tennis Coach, Andres Amores, a native of Ecuador, who was volunteering at the clinic, says this event is really about reaching Hispanic youth in Atlanta and around the country. "I came here from Ecuador to play tennis at Jacksonville State," stated Amores. "Tennis is now an international sport and there is so much room to grow the sport, especially here in the South. This is a great opportunity for kids to come out and play and get introduced to the sport." The BB&T Atlanta Open is honoring the spirit of the Olympic Games and celebrating the 20th anniversary of the 1996 Atlanta Games. There will be guest appearances all week from Olympic athletes like Fernandez, Kent Steffes, Brooke Bennett, and Gail Devers.